Operating in the UHF band with 16 switchable frequencies, it can perform under the most rigorous conditions in multi-channel installations. The system can operate in stereo or via the dual-mono function, and the receiver can be fed with two individual audio signals. It is possible to mix two separate channels on either the transmitter or receiver. The 19" metal housed rackmount transmitter features a large LCD display for frequency, RF and AF levels. There is a front-mounted pan control for stereo balance which can be configured as a L+R mix control to combine audio sources. The output can be monitored with a gain control from either a 3,5mm or 6,5mm stereo jack socket. Balanced XLR inputs and outputs allow units to be cascaded. 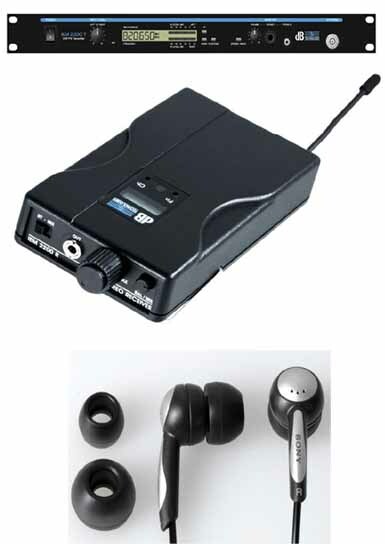 The IEM 2200 system offers user safety through the use of limiter circuits in both the transmitter and receiver. In combination with every InEar Transmitter, you can use as many 2200R receivers as you like. Each system will receive the signal from the transmitter in its frequency is tuned to.